In 1837, a tragedy strikes, leaving infant Matilda Johnson in the care of her elderly grandmother, Avis Wisby. Since learning the hard way, I’ve always been an advocate of exploring your relative’s neighbours and house guests in census returns. In one such case, I unraveled a mystery that led me to a tragic yet peaceful accident. When their youngest child was no more than 2 years old, my Gtx4 Grandmother Avis Martin (née Tall) lost her husband Robert Martin at the age of 41 in the March of 1826. With his death prior to certification, any efforts to find the cause would likely be zero. The burial register of the fenland village of Little Downham, Cambridgeshire, England, gives no clue. The couple had become parents six times since their marriage in 1812, but life had dealt them a cruel hand in these bleak fens – their first (William), fourth (Elizabeth) and fifth child (Robert), all failing to thrive. Elizabeth made it to 2, Robert less, and William died just 4 months after their father in July 1826. He was 13. 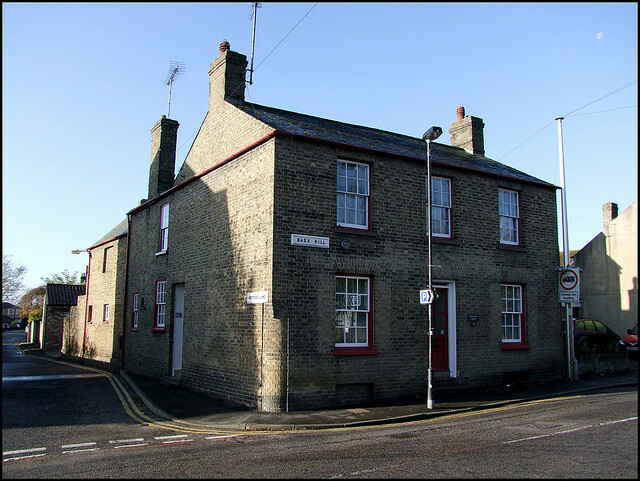 Avis was now a widow at 38 years in a remote fenland village with three remaining children (James, Sarah, and a second Robert). By August 1827, she re-married, this time to James Wisbey, and by 1830 the couple had their first son. 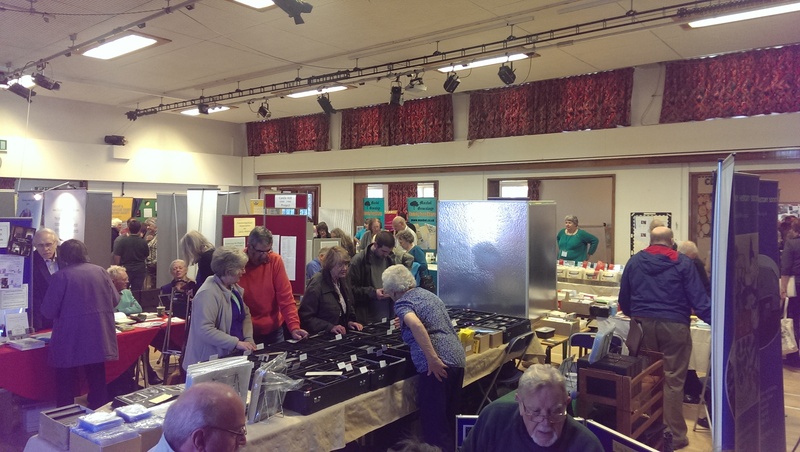 For once, life was a bit ‘on the up’. By 1834, her daughter Sarah Martin had married James Johnson at Little Downham, and their daughter Matilda Johnson entered the church for her baptism on 3rd January 1836. Photo believed to be of Gt x4 Grandmother Avis. In my beloved 1851 census, I found Avis Wisbey as an ‘out door labourer‘ in what was to be her final census. I’d already killed her off in August 1858, but I noticed that she wasn’t alone. I didn’t know Matilda at this point, so was curious as to who this 17 year old Matilda Johnson was. My only clue was that she was noted as ‘granddaughter’. 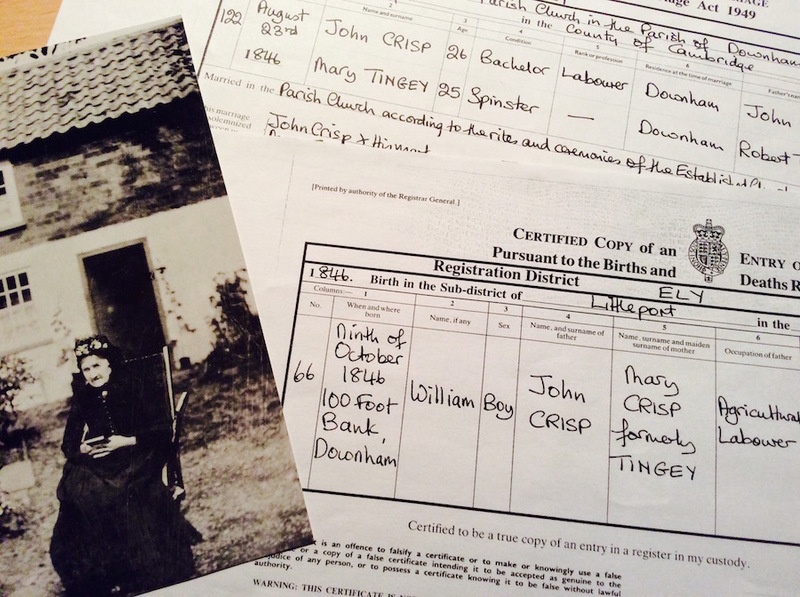 I back tracked to the less reliable 1841 census – and there she was again – this time aged ‘5’ years, and again living with her grandmother. Heading backwards through the records, I found her baptism in January 1836, and then found the Johnson/Martin marriage that belonged to her parents in 1834 – and proving her connection to Sarah Martin and Avis. But where had her parents gone? 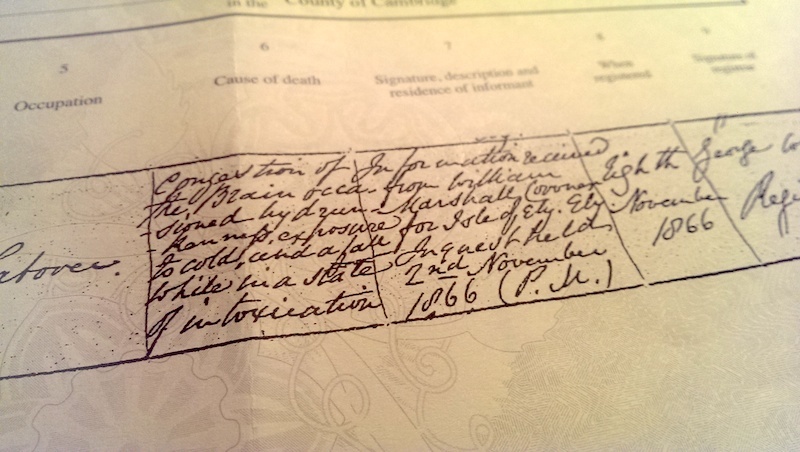 It didn’t take me long to find a burial register entry that hinted at a bigger story. On 5th February 1837, James (23yrs) and Sarah (20yrs) Johnson are buried with the register giving a clue of ‘husband and wife by suffocation‘. That’s the first time that I’ve seen ‘suffocation’ given as a cause of death, and with both husband and wife dying together by the same cause, I sensed that there must be more information. Was it foul play? Or was there some terrible accident? 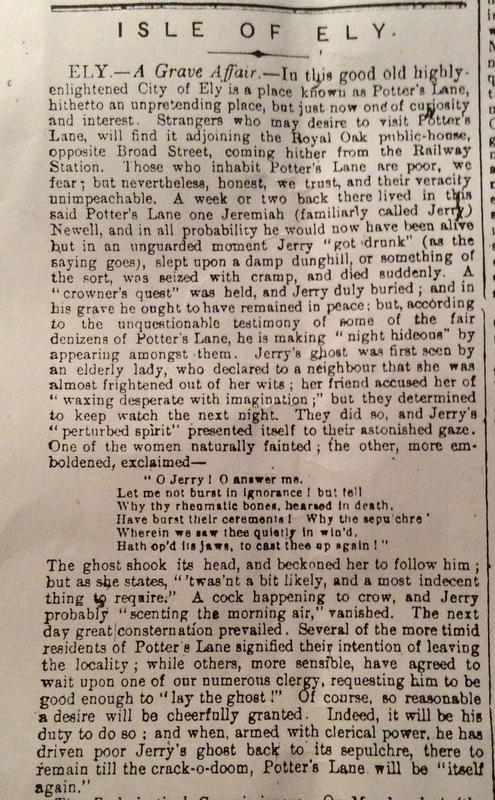 The story unfolds a little further courtesy of a number of newspapers that including The Cambridge Chronicle, and The Morning Post, and this cutting from Jackson’s Oxford Journal also of 18th February 1837, which carries a long and detailed report on the whole incident. 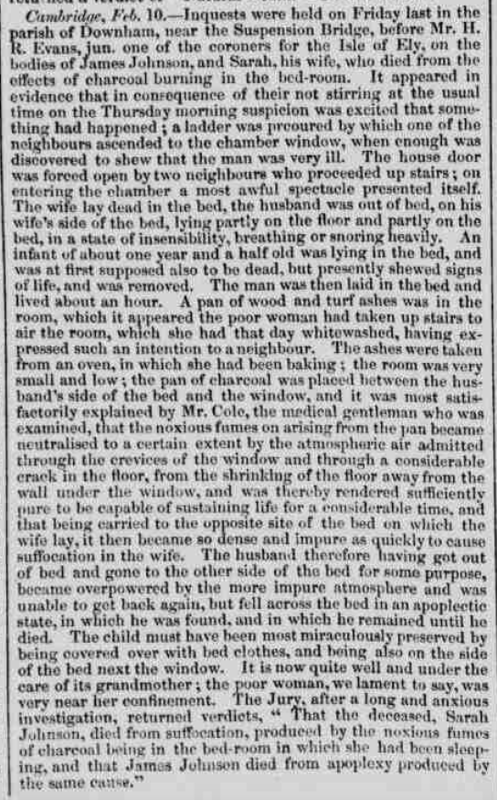 Here it states that due to a pan of ashes being in the bedroom, the wife suffocated. The husband died of apoplexy having seemingly woken but dying shortly afterwards, and that the daughter (Matilda) survived only because she was tucked further down in the the bed and saved by the sheets. It notes that Matilda entered the care of her grandmother. The story made front page news of Jackson’s Oxford Journal in February 1837. It seems that an innocent accident brought tragedy for the family. And that only by luck, through the action of neighbours, and the positioning of some bed sheets, that Matilda survived in bed – not even 2yrs old, laying amongst the bodies of her dead parents. 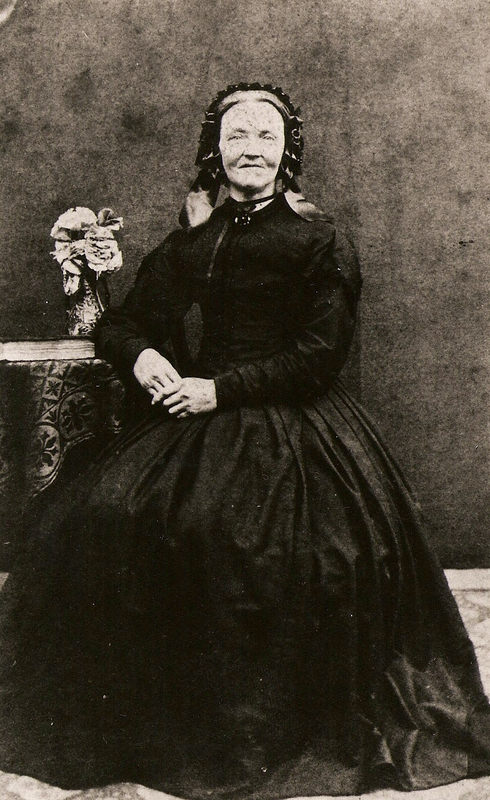 In Avis’ care, orphaned Matilda Johnson grew up. Eight months after the 1851 UK census, Matilda married John Artingstall of Lancashire, in the Little Downham church where her parents had just 17 years earlier. After a sad start to their own parenthood (their first child, Elizabeth Artingstall died as an infant), they went on to become parents a further nine times in Gorton, Lancashire. The family appear at Far Lane (briefly at No. 10) and 56 Far Lane, Gorton. John died in 1897 aged 69, and Matilda reached the ripe old age of 81, dying in 1917. She survived tragedy by a stroke of luck, and lived a full life, becoming a grandmother herself, via her own daughter, who took here late mother’s name – Sarah.